Our current read-aloud book is the chapter book Millions by Frank Cottrell Boyce. Two English elementary school brothers stumble onto a stack of cash, just before the pound will become obsolete, in favor of the Euro. They have sixteen days left, and at their current rate of spending, it will still take the boys 655 days to get rid of their secret stash of money. They try everything — hire a taxi to take them home from school, buying used toys from their friends at school, and they’re paying ten pound notes for extra portions of desert in the school cafeteria. There are other subplots as well — the boys recently lost their mother, and they have for months relied upon their story, “we just lost our mom” to open doors and candy shops for them. Now, they no longer need to rely on other’s sympathy to get what they want… because they have cash. Here’s an excerpt from my favorite part of the book — and the part that got the most laughter out of the boys, so far. 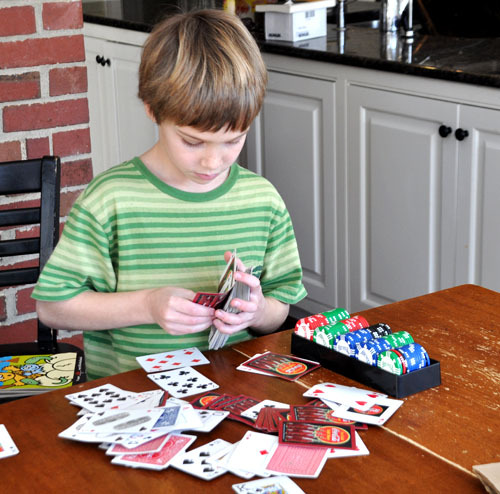 The boys play “cash Jenga” with the door closed to the bedroom (they can’t let their dad find out about the cash), and it inspired my kids to figure out if they could do the same thing — with a deck of cards. We were seriously disappointed. As the boys said, “they left so much out!” Then, they did the math of how long it took us to read the book, so just imagine how long the movie would have to be. The book was much better than the movie, but there was one scene in the movie that became crystal clear to me on the screen, rather than the printed page. You’ll have to get the book, and watch the movie to see what I mean… then email me to see if we agree. A friend once told me I should learn to play golf, so that I would have something to do with my boys when they’re all grown up. I have yet to learn. Still, I’m hoping that we can have a grown-up book club someday between us, because to date, most of our greatest memories come from the time we spend sharing books together. You are so lucky to have this connection with your boys. My BA doesn’t devour books in the same way I (used to) do. We have enjoyed Harry Potter and Twilight together however. This one sounds good. I’ll keep an eye out for it.